PRESSURE IS MOUNTING on government to clarify who knew what and when about the massive overspend on the new children’s hospital. Fianna Fáil and Labour have rounded on the ministers’ claims that they were unaware of escalating costs for the national’s children’s hospital, with Fianna Fáil’s Barry Cowen stating that it is “not credible”. Health Minister Simon Harris was expected to brief Cabinet today about the next steps in progressing with the project, and selecting a new chairperson of the board. Tom Costello, who had been involved with the project for six years, stepped down as chair of the board over the weekend. The focus is now shifting on the Department of Public Expenditure and its role in the project. “Fine Gael can’t claim to be a party of prudence and financial management and not be accountable,” said Cowen today. He added that Harris and Public Expenditure Minister Paschal Donohoe stating that they were unaware prior to last November of the overruns were “not credible”. Labour leader Brendan Howlin said it is “beggars belief” that Harris did not inform the Donohoe about the overrun when he was informed about it in August. “The Secretary General of the Department of Health told us last week that the Department of Public Expenditure were informed about problems with costs in October 2018. It is hard to believe it would take over a month for officials in DPER to inform Minister Donohoe of news of this nature,” said Kelly. It’s very hard to understand why the Minister for Public Expenditure wasn’t informed of a cost overrun of this scale considering it is one of the largest capital projects being undertaken by the State. This Minister has to bring a memo to cabinet every single month on all major items of expenditure so how come he wasn’t aware of this massive overspend and reporting it to cabinet. You’d have to question how his Department is actually functioning if this wasn’t happening? Speaking yesterday, Donohoe, told RTÉ’s Morning Ireland that the escalating costs of the children’s hospital should have been known earlier. Donohoe said that the awareness of rising costs had started to build before November but that he was not made aware of it until then despite an official from his department being on the board. “I was not informed of the development of the issue, I do have an official on the board and that official was bound by the responsibilities that he has to the board. Yes, things should have been done differently in relation to the flow of information. But ultimately if we do not go ahead this project, even at the higher cost, we are not going to deliver a transformative project for the health of young children in our country. Last week the Oireachtas Public Accounts Committee heard the total cost of the project is “highly unlikely” to come in under €2 billion. The Department of Public Expenditure is expected to face further questions this week about the role of one of its senior officials, Paul Quinn, the government’s chief procurement officer. Quinn sat on the National Paediatric Hospital Development Board since 2013. Last week at the Oireachtas Health Committee meeting, Fine Gael TD Kate O’Connell said she found it “very disturbing that the head of procurement, who was on the board, knew about this”. She asked why it was not raised in the department sooner than it was. Quinn has been asked to come before PAC to answer for his department and his role in the overrun. Other than when the department was informed about the spiralling costs, another question about the location of the hospital has resurfaced, with calls for the PwC review into the cost overruns to be expanded to include whether the location is correct. Over the years, there has been much heated debate about the location of the new hospital on the St James’ site, with critics stating that it should have been built on a green-field site, away from the city centre. The hospital was originally given the green light to be built on the location of the Mater Hospital, but this was later rescinded. 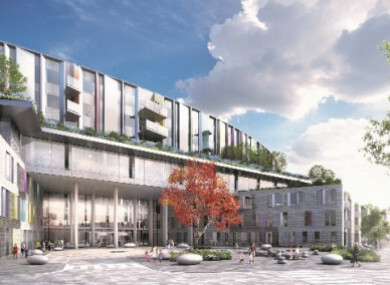 In 2017, a number of rural TDs said children would be left languishing in ambulances in Dublin traffic if the new children’s hospital is built on the St James’s site. Campaigners suggest the campus of Connolly Hospital in Blanchardstown as a more suitable site. Yesterday, Finance Minister Paschal Donohoe rejected a call from Fianna Fáil spokesperson on Health, Stephen Donnelly, for PwC’s review to look at the feasibility of moving the development to another location. “I think it would be useful, based on the fact that a lot of parents have raised the issue and pediatric clinicians have raised the issue for PwC to include it,” Donnelly told Morning Ireland. If PWC were to come back and say, ‘look at this stage it wouldn’t save any money but it could add ten years’, well then clearly we shouldn’t do it. Rejecting the calls, Donohoe said that because of the progress at the St James’ site, relocation is not possible. “Otherwise, we’re facing years of delays. I believe the location is right. It was the subject of many clinical reviews,” he said. Relocation is definitely not an option, according to government sources, who state that construction is already well-advanced, and to stop now would incur further costs for the project. They state the government had three options it could take when it became apparent the cost overruns would be substantial. The first option was to pause the project. To stop a project that has been discussed since 1962 and prevent a world-class hospital being built was ruled out. The second option was to re-tender the project. Department sources state that all of the expert evidence was that re-tendering the project would have cost more for the taxpayer above and beyond the very significant existing cost and would have increased the length of time it would take to deliver this project, which the minister said is already well overdue in terms of the expectation of the Irish people. The Oireachtas Public Accounts Committee heard last week that to re-tender would cost in excess of €300 million, and could delay the project by a number of years. The third option was to proceed. Harris said he believed there was no other option but to proceed and ultimately, that is the decision that the government took. Harris said it was one of the hardest decisions the government has made, adding that if this was any other project, one might be thinking it could not go any further, “but we could not stop this project because it is so badly needed in terms of the infrastructure for our children”, he said. Speaking last week, Harris said when the cost overruns first came to light he was faced with a decision on whether to proceed with the project or not. While the relocation of the hospital appears to be firmly ruled out, question marks still hang over who will be held responsible. Harris told RTÉ’s Today with Sean O’Rourke programme yesterday that the government had always intended on holding individuals accountable. PwC can’t be sanctioning individuals, that’s not their job. Their job would be to identify the weaknesses. Then it will be for myself and the Government to take actions in terms of sanctions if they’re required. Email “'Beggars belief'': Pressure continues to mount on ministers to explain when they knew about children's hospital overspend ”. Feedback on “'Beggars belief'': Pressure continues to mount on ministers to explain when they knew about children's hospital overspend ”.